We offer a unique shopping experience with something for everyone including books, toys, accouterments, musical instruments, replicas & collectibles, novelties, art, and crafts. You will find us at 22725 Main Street, directly across from Nelson’s Columbia Candy Kitchen and adjacent to Kamice’s Photographic Establishment and the Candle Courtyard. 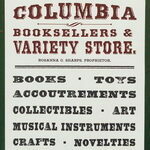 Visit our website at www.columbiavarietystore.com. We look forward to seeing you!